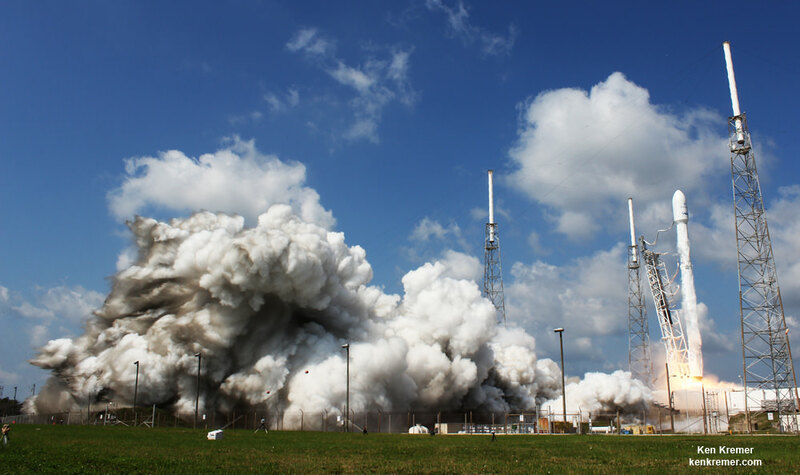 CAPE CANAVERAL AIR FORCE STATION, FL — Nearly perfect weather greeted the blastoff of a nearly identical pair of xenon propulsion commercial telecom satellites carried to orbit today, Wednesday, June 15, by an upgraded SpaceX Falcon 9 rocket from the Florida space coast. The secondary and experimental goal of soft landing the first stage booster on an ocean going platform for later reuse was not successful – but also not unexpected due to the high energy of the rocket required to deliver the primary payload to orbit. Note: check out the expanding gallery of launch photos and videos from my space colleagues and myself. Liftoff of the 229 foot tall SpaceX Falcon 9 took place at the opening of Wednesday’s launch window at 10:29 a.m. EDT (2:29 UTC) under mostly sunny skies with scattered clouds, thrilling crowds along the beaches and around the coastal areas. Wednesday’s blastoff came just 4 days after this weekends (June 11) launch from the Cape of the world’s most powerful rocket – the Delta 4 Heavy – which delivered a huge spy satellite to orbit for the NRO in support of US national defense. The goal of the launch was to deliver the Boeing-built EUTELSAT 117 West B and ABS-2A satellites to orbits for Latin American and Asian customers. “Ascent phase & satellites look good,” SpaceX CEO and founder Elon Musk tweeted. However the 156 foot tall first stage booster descended too quickly due to insufficient thrust from the descent engines and crashed on the droneship. “But booster rocket had a RUD on droneship,” Musk noted. RUD stand for rapid unscheduled disassembly” which means it exploded on impact. “Looks like thrust was low on 1 of 3 landing engines. High g landings v sensitive to all engines operating at max,” Musk elaborated. The crash follows three straight landing successes – mostly recently on May 27. See my onsite coverage here of the boosters return to Port Canaveral on the ICISLY droneship. The satellites are based on Boeing’s 702SP series program and were the first all-electric propulsion satellites when Boeing introduced it in 2012, a Boeing spokesperson Joanna Climer told Universe Today. Liftoff occurred from Space Launch Complex 40 on Cape Canaveral Air Force Station in Florida on time at 10:29 a.m. EDT (2:29 UTC). The crackling roar of 1.5 million pounds of thrust generated by nine Merlin 1 D engines was so load that even spectators watching some 20 miles away in Titusville, Fl heard it load and clear – eager onlookers told me with a smile of delight ! Folks enthusiastically shared experiences upon returning from my press site viewing area located less than 2 miles away from the launch pad ! The webcast offered a detailed play by play of launch events and exquisite live views from the ground and extraordinary views of many key events of the launch in progress from the rocket itself from side mounted cameras looking up into space and back down to the ground. Falcon 9 delivered the roughly 5000 pound commercial telecommunications satellites to a Geostationary Transfer Orbit (GTO) for Eutelsat based in Paris and Asia Broadcast Satellite of Bermuda and Hong Kong. They were deployed at about 30 minutes and 35 minutes after liftoff. Eutelsat 117 West B will provide Latin America with video, data, government and mobile services for Paris-based Eutelsat. ABS 2A will distribute direct-to-home television, mobile and maritime communications services across Russia, India, the Middle East, Africa, Southeast Asia and the Indian Ocean region for Asia Broadcast Satellite of Bermuda and Hong Kong. There are only minor differences between the two satellites. They were vertically stacked for launch and encased inside the Falcon 9 nose cone, or payload fairing using a Boeing-patented and customized interface configuration – as seen in the photo herein. The telecom sats are “very similar, but not identical,” Climer told Universe Today. They were tested at the Boeing Satellite Development Center in El Segundo, Calif., to ensure they could withstand the rigors of the launch environment. They have a design lifetime of a minimum of 15 years. The satellites have no chemical thrusters. They will maneuver to their intended orbit entirely using a use xenon-based electric thruster propulsion system known as XIPS. 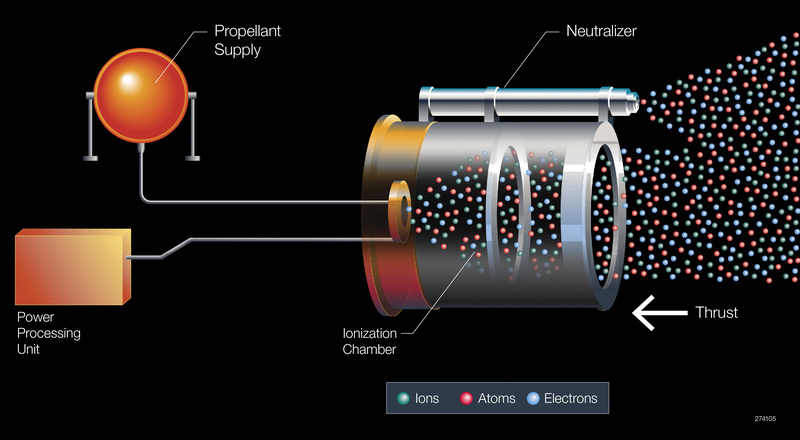 XIPS stands for xenon-ion propulsion system. By using xenon electric propulsion thrusters, Boeing was able to save a lot of weight in their manufacture. This also enabled the satellites to fly together, in tandem rather than on two separate launches and at a much cheaper price to Eutelsat and ABS. “XIPS uses the impulse generated by a thruster ejecting electrically charged particles at high velocities. XIPS requires only one propellant, xenon, and does not require any chemical propellant to generate thrust,” according to Boeing officials. Wednesday’s launch was the sixth of this year for SpaceX. Later this year, SpaceX hopes to relaunch one of the recovered first stage boosters that’s seems fit to fly. Two others which landed harder will be used for long life testing. One of my very attentive readers, Marie Bieniek, apparently spotted one of the recovered boosters being trucked back on US 19 North of Crystal River, Fl earlier this week, headed for SpaceX facilities possibly in Texas or California. She was just driving along the Florida roads on Rt. 19 on Monday, Jun 13 when suddenly a Falcon appeared at about 11 AM! She kindly alerted me – so see her photo below. The SpaceX rockets and recovery technology are all being developed so they will one day lead to establishing a ‘City on Mars’ – according to the SpaceX’s visionary CEO and founder Elon Musk. Musk aims to radically slash the cost of launching future rockets by recycling them and using them to launch new payloads for new paying customers. Watch for Ken’s continuing on site reports direct from Cape Canaveral Air Force Station and the SpaceX launch pad. CAPE CANAVERAL AIR FORCE STATION, FL — Less than three weeks after their last successful launch and landing attempt involving a Thai payload, SpaceX is set to continue the firms rapid fire pace of satellite deliveries to orbit with a new mission involving a stacked pair of all-electric propulsion commercial comsats that are due to liftoff tomorrow, Wednesday morning. Working off a hefty back log of lucrative launch contracts SpaceX is targeting Wednesday, June 15 for the launch of the Boeing-built EUTELSAT 117 West B and ABS-2A satellites for Latin American and Asian customers from Cape Canaveral Air Force Station in Florida on an upgraded Falcon 9 rocket. SpaceX is aiming to launch at the opening of Wednesday’s launch window at 10:29 a.m. EDT (2:29 UTC) which closes at 11:13 a.m. EDT. 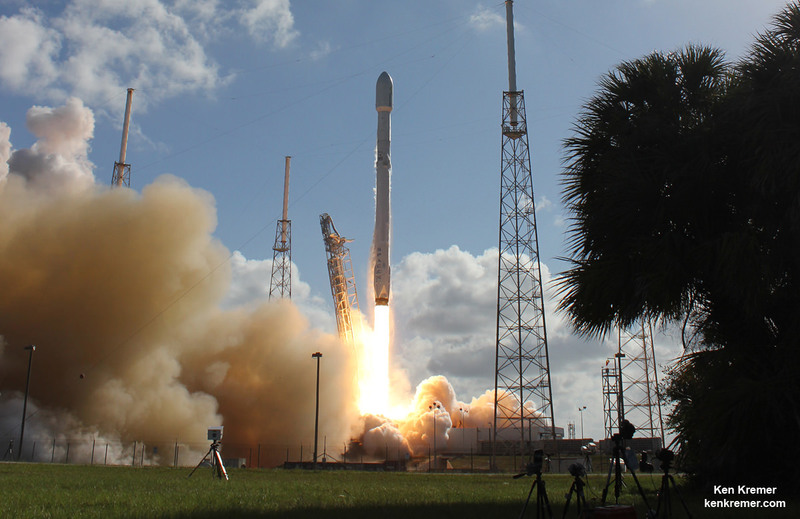 SpaceX most recently scored a stellar success with the double headed launch of Thaicom-8 and sea based first stage landing on May 27 – as I reported here from the Cape. And Wednesday’s launch comes just 5 days after Saturday’s (June 11) launch from the Cape of the world’s most powerful rocket – the Delta 4 Heavy – which delivered a huge spy satellite to orbit for the NRO in support of US national defense. Indeed what makes this flight especially interesting is that the satellites are based on Boeing’s 702SP series program and were the first all-electric propulsion satellites when Boeing introduced it in 2012, a Boeing spokesperson Joanna Climer told Universe Today. The 229 foot-tall (70 meter) Falcon 9 will deliver the roughly 5000 pound commercial telecommunications satellites to a Geostationary Transfer Orbit (GTO) for Eutelsat based in Paris and Asia Broadcast Satellite of Bermuda and Hong Kong. For the fourth time in a row, the spent first stage booster will again attempt to propulsively soft land on a platform at sea some nine minutes later. You can watch the Falcon launch live on Wednesday via a special live webcast directly from SpaceX HQ in Hawthorne, Ca. The two stage Falcon 9 rocket has a 44-minute long launch window that extends until 11:13 a.m. EDT on Wednesday, June 15. The path to launch was cleared after SpaceX engineers successfully carried out a brief static fire test of the first stages engines with the rocket erect at pad 40. The customary test lasts a few seconds and was conducted headless – without the two satellites bolted on top. The vertically stacked pair of comsats are “very similar, but not identical,” Climer told me. They are already encased inside the Falcon 9 payload fairing and stacked in a Boeing-patented and customized interface configuration – as seen in the photo herein. The Eutelsat satellite is carrying a hosted payload for the FAA. They will detached and separate from one another in space. The top satellite will separate first while the pair are still attached to the second stage. Then the bottom satellite will detach completing the spacecraft separation event. They will be deployed at about 30 minutes and 35 minutes after liftoff. The ASDS drone ship landing platform known as “Of Course I Still Love You” or OCISLY was already dispatched several days ago. It departed Port Canaveral for the landing zone located approximately 420 miles (680 kilometers) off shore and east of Cape Canaveral, Florida surrounded by the vastness of the Atlantic Ocean. As I witnessed and reported here first hand, the Thaicom-8 first stage arrived on OCISLY six days after the ocean landing, in a tilted configuration. It was craned off the drone ship onto a ground support cradle two days later.